A geological look at Albania's Velca Block. CALGARY, ALBERTA (February 22, 2018)—With a wide range of preparatory activities now in motion, Pennine Petroleum Corporation (TSX-Venture: PNN) (“Pennine” or the “Corporation”) now anticipates a spudding date of early third quarter 2018 for its earning well No. 1 in Albania’s Velca Block. 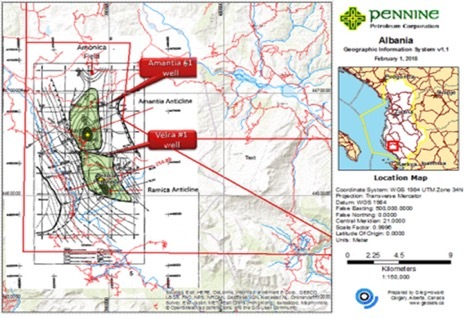 Pennine expects to determine the exact drilling location in the Vela Block, located in south-central Albania, within six weeks, following a complete integration of geophysical and geological data, says the Corporation’s Chief Executive Officer N. Desmond Smith.